this is a follow-up to my last post on 'distancology' – the science of turning all shot charts into one colorful picture. You can find a half-way clean code in my github account. If you run MakeHeatMap.R, you should actually be able to reproduce the result. One question that one naturally can ask, when comparing the shot distribution of players, is how consistent or reliable those shot distributions are. For example, in my last article I sorted around 200 players into 10 distinguishable groups, using a (vague) cutoff. But I could as well have used 5 or 20 groups. Now, the question regarding reliability is: If you compare year to year, how many players would remain inside the same shot cluster? I hope you find it as amazing as I did when I saw it the first time. Shooting distance distribution is a complicated construct that combines team strategy with the personal role of a player inside the team and things like fast break percentage or shooting habits. So, you would expect that most shot distributions vary at least a little bit. But no, 47 of 63 players are their own closest neighbors between this and last year. I have no statistical method to compare it with correlation values, but I would say that it has a p-value of bonkers. As an example, look at the top, how DeMarcus Cousins, Enes Kanter and Derrick Favors all have similar shot distributions between mid-range and close-up, but Cousins takes his mid-range shots from 20 feet out, Kanters from 17 and Favors from 14. Or that Jeff Teague and Michael Carter Williams have their close range shots a little bit further away from the basket than most players (floater? ), but Jeff Teague shoots a bit more three pointers. Or that Steph Curry and Damian Lillard are the only two MFers that regularly shoot from 27 feet out. I don't know if Damian Lillard is lazy or something, but more than 130 times this year (3rd March) he decided 'I don't want to walk this additional meter'. And 43 times he got away with it. Serge Ibaka: Exchanged a bit of his midrange and a lot of his close-up game for a three point shot. I do not feel in the position to comment on this. Trey Burke: Is a good example why clustering is not a precise science. If you compare his two distributions they both look very similar. Something in the clustering process made 2013-14 Trey Burke fall into the 'We don't go to the basket that often' group, while 2014-15 Trey Burke became 'Stephen Curry without actually making the shots'. That's it for today. Just wanted to repeat one technical thing: clustering always consists of two parts. First you find a distance metric and then you find a rule how you cluster things together. I hope I could convince you that the distance metric part is pretty awesome. I'll try to work on the linkage part if possible. 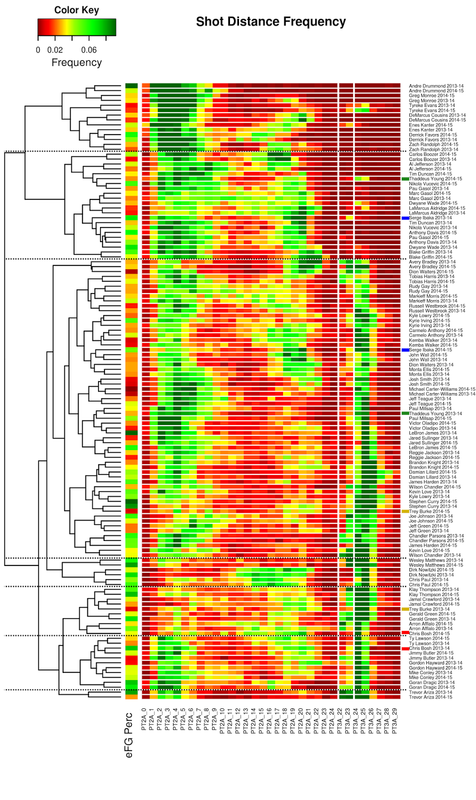 3 It is so much easier to publish heatmaps if you don't have to make them fit on a DinA4 page.